Due to London Olympic 2012 which will be held from July, 27 to August 12, 2012, MBC has announced on July 10, 2012 that the first episode of Arang and the Magistrate has been pushed back to August 15, 2012. 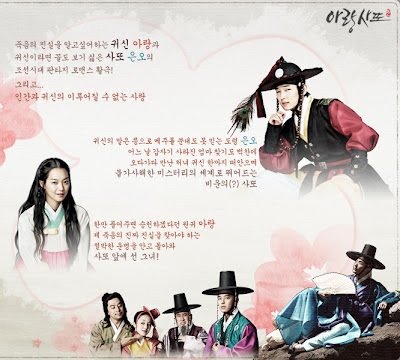 The premiere of Arang and the Magistrate staring Lee Jun Kin & Shin Min Ah originally will be aired on July 25, 2012 (after I Do I Do finishes on July 19, 2012) . So it means the premiere has been postponed by 2 weeks. But setting my selfishness aside, I'm glad that the production crew & the cast have two additional weeks; so can expect more stellar performance & stunning editing as well as cinematography.